If 1989 had produced the first English winner of the title then the 1990 race, again held in Aberdeen, ended even more dismally for home-based runners. England internationals Chris Tall (2.23.32), Stan Markley (2.24.53) and Brian McEvoy (2.25.46) swept the boards, leaving Fraserburgh’s Charlie McIntyre the honour of being first Scot home in fourth place (2.26.50). Liz Hughes from Wales successfully defended the women’s title with another personal best time of 2.49.47 while local Aberdeen AAC runners Diana Jermieson (3.25.08) and Joan Molloy (3.33.27) took home the silver and bronze awards. Liz was a particularly successful Welsh International runner on both Road and Country. She was Welsh Champion at 10 miles and the Marathon; won the Scottish Marathon title twice; finished first lady in the Great North Run; and was victorious in a World Masters 25k Road Race. The championships moved to a new venue in 1991 with the decision to hold the event in association with the Inverclyde marathon at Greenock. The Inverclyde race, backed by IBM, had first been held in 1981 when Bill Stoddart, the 1969 Scottish champion, won. Terry Mitchell travelled to the west coast hopeful of regaining the title he won at Dundee four years earlier – and he was not to be disappointed. The Fifer dominated the race, despite deplorable conditions (heavy rain and strong headwinds), he won comfortably in 2.24.50 from John Stephens (2.27.10) and veteran Charlie McDougall (2.35.51). Kilbarchan’s Eileen Masson was equally commanding when winning the women’s title for the second time in four races (2.50.12) with Julie Harvey (City of Glasgow – 3.03.19) and Margaret Blaikie (SVHC – 3.07.39) claiming the other medal positions. Eileen’s victory celebrated her comeback year after leaving marathon running in 1988 to have a baby. John Stephens, from Low Fell, in Northumbria, missed Mitchell’s break after six miles and had to grind out the next twenty on his own. 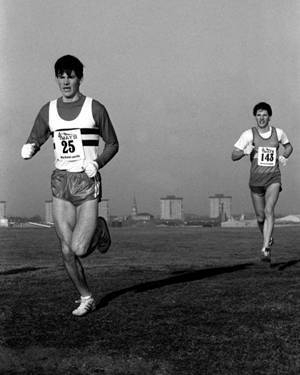 Stephens had won the Inverclyde Marathon in 1983 and 1984, while stationed with the Navy on the Clyde. He had run for Dumbarton AAC at that time and had worked as a Royal Navy physiotherapist. Charlie McDougall complained, “The wind killed me.” However the 42 year-old Calderglen Harrier could be proud of a good performance. 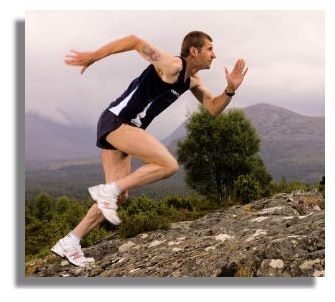 Charlie went on to have a very successful career as a veteran, including running well several times for Scottish Masters in the annual British and Irish Masters Five Nations International Cross Country. Fraser Clyne waited until the latter stages of his career before the national championship grabbed his attention. The Arbroath-born runner made his marathon debut as a 26 year-old at Aberdeen in 1981 on a day ravaged by howling gales and driving rain. It was a sobering experience as, after briefly taking the lead with six miles to go, he faded badly to finish fourth behind Max Coleby, Martin Knapp and Donald Macgregor in 2.23.36. It was to be another eleven years before Clyne entered the Scottish Championship for the first time, at Elgin, but in the intervening period he was to become one of the country’s most experienced exponents of the marathon. Between September 1982 and December 1991 he broke the 2 hours 20 minutes barrier on 22 occasions. His best performance was undoubtedly in the 1984 United States Championship race incorporated within the California International Marathon at Sacramento where he finished runner-up to America’s Ken Martin in 2.11.50. Clyne competed regularly in America and also performed in Australia, South Korea, Japan, Italy, Africa and Germany. He represented Great Britain in three World Cup Marathons but could finish no higher than 47th. He was 10th in the 1986 Commonwealth Games in Edinburgh. The Metro Aberdeen member was a couple of weeks short of his 37th birthday when he travelled to Elgin for the 1992 Scottish Championship race. The event, held along with a 10km and half marathon as part of the Macallan Moray Festival of Running, was organised by Moray Road Runners. It started and finished in Elgin’s Cooper Park and the course followed a series of quiet rural roads past Burghead and Lossiemouth. This was the furthest north the championship had ever been held. Although Clyne was taking part in the championship for the first time he still wasn’t taking the event too seriously. His training diary reveals that 90 miles had been run in the seven days before the Moray race so he was hardly well rested for the challenge. John Duffy of IBM Spango Valley (formerly of Greenock Wellpark Harriers – and later of Shettleston Harriers) got the race off to a spritely start on a bright but breezy day. The stiff climb out of Elgin after two miles resulted in a slowing of the tempo and soon a small group which included Duffy, Clyne, George Reynolds of Forres, Aberdeen-based New Zealander Stuart Mills, Ayr’s Alistair Stewart and the Teviotdale pair Nicol Maltman and Andy Fair settled in at the head of the field. Duffy seized the initiative approaching the 12 mile mark by increasing the pace and quickly pulling away from the group which immediately began to break up. Clyne allowed the Spango Valley man to open a lead of 100 metres before setting off in pursuit. The Aberdeen athlete quickly pulled in his rival and swept past to open up a gap which stretched to almost three minutes by the end of the race. Clyne coasted home in 2.25.38. It was the slowest time he had ever run for a marathon but a course record nonetheless. Duffy collected the silver medal in 2.28.25 and Mills was a clear third in 2.30.16. ‘I just did enough to win,’ Clyne said at the time. ‘I wanted to win the title but I also didn’t want to interrupt my training which is aimed at the California International Marathon in December.’ (Clyne later ran 2.20.5 in the American race). Trudi Thomson of Babcock Pitreavie AC, who would later become an international class marathon and ultra-distance runner, won the women’s race in 3.14.30. Fiona Nicholson and Clare Slatter were well behind in second and third respectively. The 1992 championship was the last one held under the auspices of the Scottish AAA and the Scottish WAAA. From now on a new single governing body, the Scottish Athletics Federation, would rule the sport. The 1993 championship returned to Greenock and was again incorporated within the annual Inverclyde race organised by Tom Tracey, Bill Stoddart and their colleagues. Sponsorship was provided by the local IBM factory. On a windy day Fraser Clyne easily retained the title after moving into the lead at nine miles and running solo for the rest of the race. He stopped the clock at 2.26.40 to finish three minutes in front of visiting Englishman Raymond Lees (Clayton-le-Moors) with veteran Falkirk Victoria Harrier Denis McAra outsprinting Martin Coyne (Leslie Deans RC) for third place in 2.32.09. Again Clyne had done little resting prior to the event. The previous Sunday he had won a half marathon at Dyce and four days later posted a sub-20 minute time to win a four mile race in Aberdeen. Ultra-distance star Eleanor Robinson of the North-East Veterans Harriers Club and Border Harriers travelled north from her home in Brampton to win the 1993 women’s championship in 2.55.42. ‘It was hard going in the early part of the race but there were some beautiful views in the later stages,’ she said. Kate Todd (Johnny Walker Kilmarnock Harriers and M. Thomas (Westerlands AC) won silver and bronze. Loch Rannoch hosted the 1994 championship. With the familiar shape of Schiehallion providing a dramatic backdrop to a course which followed a loop around the loch, the scenery was impressive. A warm June day with a strong westerly wind made sure life would be tough for the 150 competitors. Fraser Clyne turned up hoping to emulate Joe McGhee by winning the title three years in a row but the presence in the field of Terry Mitchell, also seeking a third championship win, ensured this would not be easily achieved. Mitchell set the early pace along with Peterhead AAC’s Alan Reid while Clyne was happy to tag alongside. The refreshment stations caused the leaders some concern as the cups were filled with suspiciously discoloured water. Speculation centred upon whether this was the natural peaty colour of the local tap water or, of more concern, had the cups been filled directly from the nearby loch? Whatever, Reid dropped out shortly before the ten mile mark – but not because of anything he had consumed. A calf injury flared up, leaving the North District man no option but to pull out. Mitchell and Clyne continued onwards through the halfway point together. Suddenly, however, Clyne opened a 100m lead on an uphill stretch at the head of the loch. Any thoughts the Aberdeen man might have entertained that the race was won were quickly dispelled, as Mitchell came storming back a mile or so later. The rejuvenated Fifer brushed quickly past the defending champion and began to pull away. By 19 miles Terry enjoyed a lead of over 200m and Fraser looked beaten. The race, however, still had another dramatic turn to take. Clyne rallied once again as the course twisted through the grounds of Rannoch School. ‘I sensed that Terry was no longer going away from me and that I might still have a chance,’ Clyne said afterwards. Between 20 and 23 miles Clyne hunted down his rival and with two miles remaining the two men were again locked together in an exciting dogfight. ‘As soon as I caught Terry I got a terrible attack of stomach cramp and thought I’d blown it,’ Clyne recalled. ‘I gained some comfort, however, by looking at Terry and realising he was suffering more than me.’ Fraser summoned up one final effort which gained him an eventual hard-earned winning margin of 38 seconds. It was a course record and the result meant that he had emulated Joe McGhee’s record of three wins in a row. Spectators had to wait over 14 minutes until the bronze medallist came into view when Jim Douglas of FMC Carnegie Harriers edged home, 11 seconds clear of 48 year-old Pitreavie man Archie Duncan. 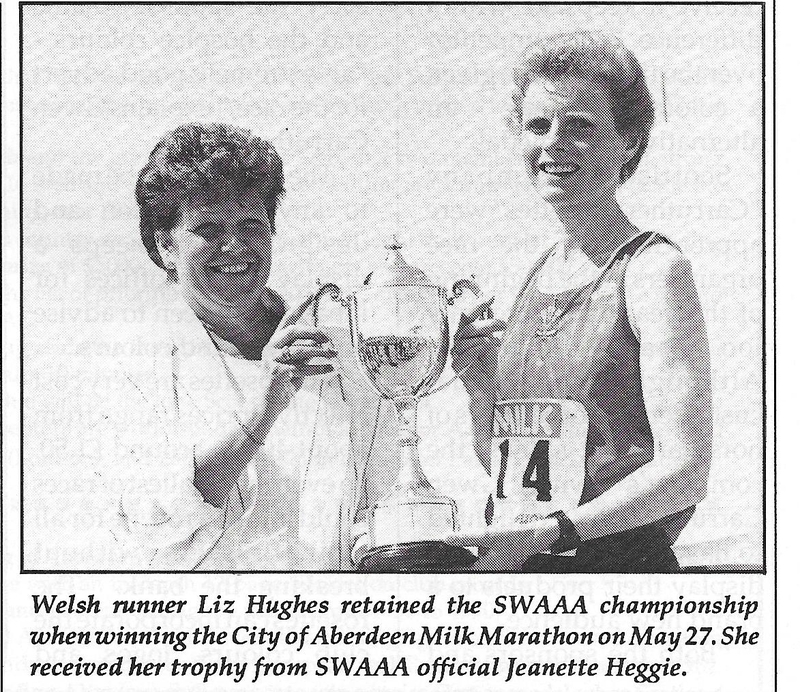 Janis Gjelseth of Shettleston Ladies took the 1994 women’s title in 2.58.37 with Jan Thomson of FMC Carnegie Harriers second in 3.07.34 and Diane Harvey of Tipton third. Fraser Clyne passed up on the chance to go for a fourth straight win in 1995 – the 50th edition of the championship. He had received an invitation to compete in the famous Two Oceans Marathon, held over a 35 mile course at Cape Town, just one week before the SAF championship race at Fort William. The lure of representing Great Britain in the famous South African ultra event proved too hard to resist. In 1995 at Lochaber, John Duffy, a powerful runner who had moved to Shettleston Harriers from IBM Spango Valley, seized the opportunity to grab his first national title. Duffy was pressed hard in the first half of the race by Alan Reid, the 29 year-old Banff-based athlete, who was rated one of the best distance runners in the North of Scotland. 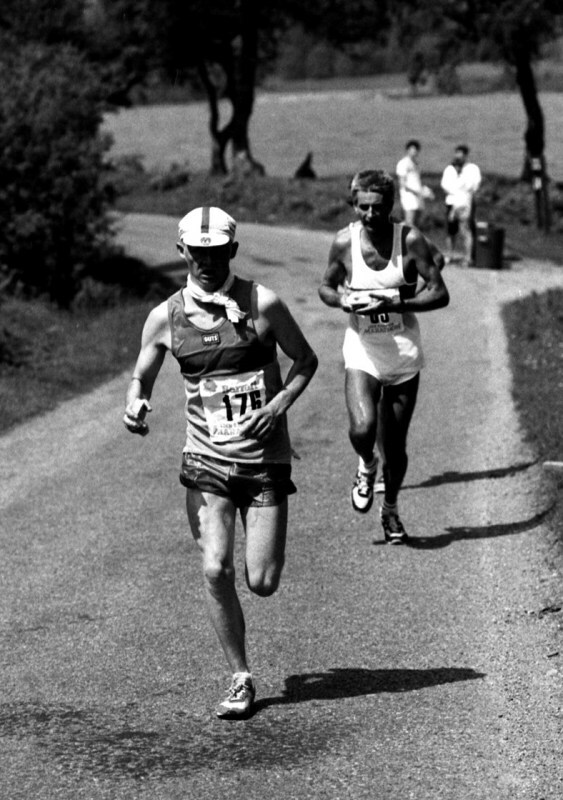 (Later on, Alan ran for GB over 100km; and won the British title at that distance.) 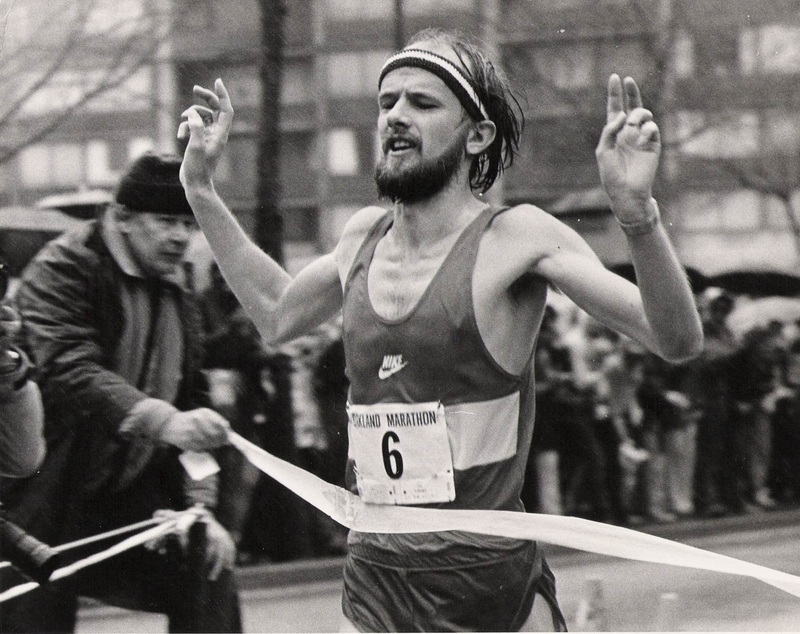 Reid had made his marathon debut as a teenager in the Easter Ross race many years earlier. His only other attempt at the distance ended in failure at Loch Rannoch when he was forced to drop out with injury – and now he was hoping it would be a case of third time lucky. Duffy, however, proved too strong in the second half of the contest and gradually eased home in 2.31.19. Reid suffered badly in the closing stages and was in danger of failing to get a medal of any description until he rallied to overhaul Richard Davidson and Davie Fairweather – just ten seconds separated these three at the end. Margaret McLaren became Fife AC’s first-ever women’s marathon champion when she recorded 3.07.17 to get the better of Susan Low and Corina Cramer. 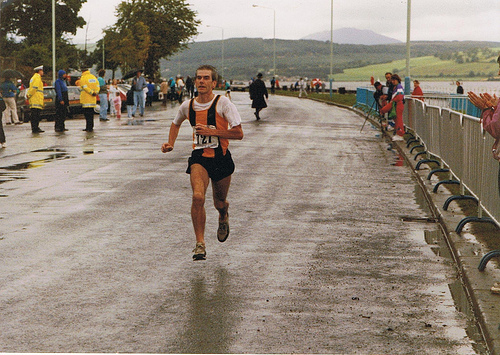 Clyne returned to the fray in 1996 when the championship was again held in conjunction with the Inverclyde marathon at Greenock. The Metro Aberdeen man was familiar with the route having won this race in 1993. He travelled to the west coast with clubmates Peter Jennings, Jackie Stewart and Charlie Benzies and the North-east squad loaded up with carbohydrates in a Glasgow pizza joint on the eve of the contest. John Duffy, a Civil Servant, who had won a silver medal in the European veterans’ marathon championship in Malmo earlier in the year, overhauled Scally (2.31.37) in the closing stages to take runner-up spot for the second time in five years (2.30.41). 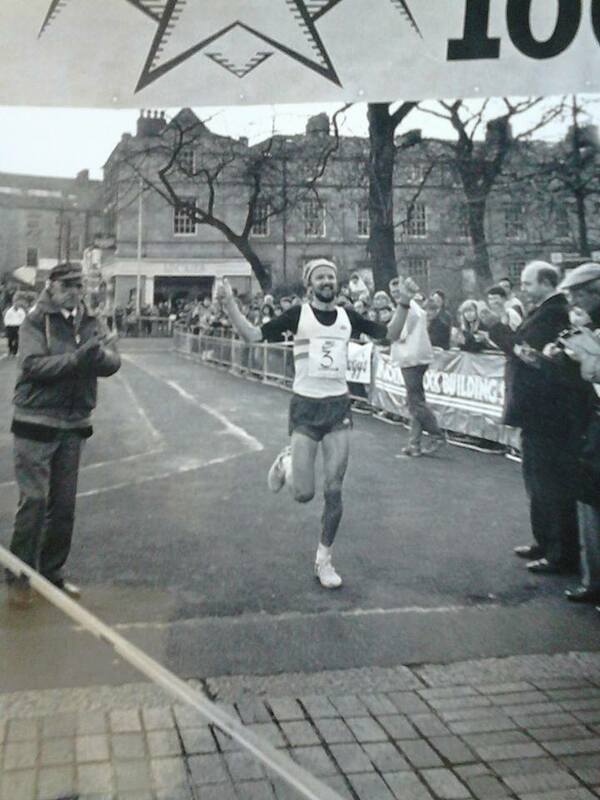 Duffy enjoyed a good career for fourteen years as a marathon runner (Personal Best 2.18.44 in 1987) – with two wins at Lochaber and four at Inverclyde, as well as becoming 1996 British Veterans Marathon Champion at the Potteries Marathon in Stoke-On-Trent. Ultra-distance expert Eleanor Robinson (Border Harriers) was an untroubled winner of the 1996 women’s title in 2.56.47 with Carol Lisle of FMC Carnegie Harriers taking silver in 3.27.17. Pat Donald of Deeside Runners, competing in her first marathon, took away the bronze in 3.30.35. Eleanor Adams/Robinson achieved fantastic success as an ultra runner in the 1980s and 1990s. Her best performances included: being the first woman to run over 150 miles in a 24-hour race; and twice being World Champion in IAU 100km events. Wikipedia has the whole amazing story. 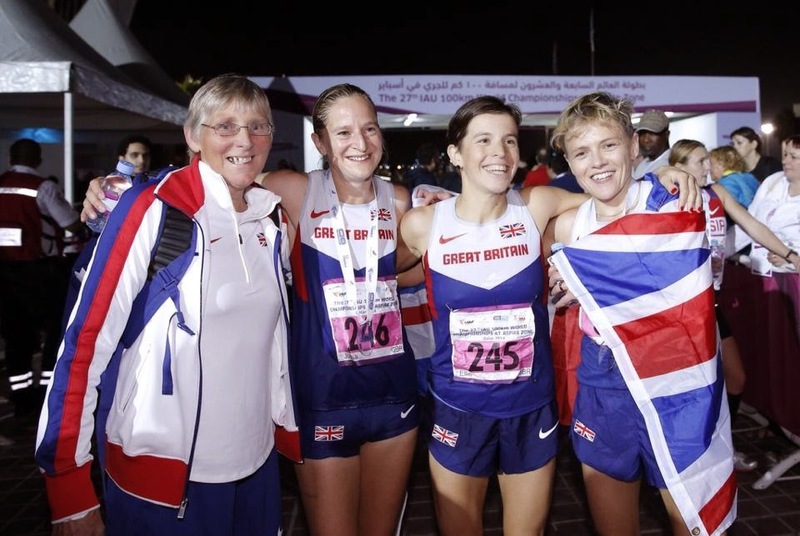 Well after her retirement, Eleanor helped the GB Women’s team at the 2014 IAU World 100km Championships, when Scottish International runner Ellie Greenwood (who lives in Canada) won individual gold, setting a new Scottish record of 7.30.48. Along with Joasia Zakrzewski (a Scottish Marathon International, living in Dumfries), Jo Meek and Emily Gelder, GB won the team title as well. Fraser Clyne travelled to Elgin to bid for a fifth title in 1997 at the age of 42. Interest in the championship had dwindled to an all-time low and even some of the people involved with the organisation of the event were unaware it had been given championship status. ‘When I handed the trophy over to them before the start of the race an official asked what it was for,’ Clyne said. The race itself was over within the first two miles. On a warm and blustery day Stevie Ogg of FMC Carnegie Harriers kept with Clyne for a little more than ten minutes before dropping well off the pace. Clyne, who had been worried by a foot injury in the preceding weeks, was able to relax and cruised away to win by more that ten minutes in 2.29.39. Ogg achieved his aim of securing a London qualifying time when finishing second in 2.39.39; while Londoner Steven Kovacs seemed bemused at receiving a championship bronze medal after taking third place in 2.45.18 – it was the slowest medal-winning time for more than 30 years. Kate Jenkins of the Carnethy Hill Running Club was a convincing winner of the women’s race when recording 3.18.07 to finish well ahead of Pat Donald of Deeside Runners (3.44.38) and Val Goldie of Milburn Harriers (3.51.48). The 1998 championship returned again to Greenock. Brian Scally made up for the disappointment of hitting the wall two years earlier to become the sixth Shettleston Harrier to win the title after leading for most of the way. His time of 2.29.32 saw him finish well clear of Anglo-Scot David Thompson, from Portsmouth, who stopped the clock at 2.33.48. Terry Mitchell added to his medal collection (two gold, two silver and now one bronze) by finishing an isolated and weary third in 2.39.06 – ‘my slowest-ever marathon’. The women’s race was won in equally emphatic fashion by Gala veteran Pat Affleck who recorded 3.04.05 for 18th place overall in the field of 63 runners. Frances Florence of Shettleston was second in 3.11.29 and Val Goldie of Milburn claimed bronze for the second year in a row with a time of 3.47.46. Big-time marathon running returned to Scotland in 1999 with Puma’s decision to back a new race between Dunfermline and Edinburgh. With a huge budget, the organisers set about attracting a world-class field, and the SAF decided this was just the right sort of showcase event with which their championship should be linked. The route chosen between Scotland’s ancient and modern capitals (a hilly one including the Forth Road Bridge) was not the easiest for the huge field of 5000 to negotiate. Not surprisingly any thoughts of British record times were soon thrown out of the window, but Mexico’s Andres Espinosa did set a championship best performance when winning the title in 2.14.31 – bettering Jim Dingwall’s 22 year-old mark. Wicslaw Mokaya of Poland was runner-up in 2.16.33 and Eliass Chelanga of Kenya took the bronze in 2.16.59. Although English runners had taken the top three places in the 1990 championship race, this was the first time that all three medals had left the British Isles. Glasgow-born Paul Evans, who has lived in Lowestoft for most of his days and has represented England, was the first ‘Scot’ to complete the course when finishing fourth in 2.17.35. Evans and the next two Scotsmen – Jamie Reid of Law and District (2.25.39) and Martin Ferguson of City of Edinburgh (2.29.55) – were awarded special medals. The women’s medals also went overseas with Kenya’s Esther Kiplagat winning in 2.33.09 from Poland’s Violetta Kryza (2.33.44) and Kenya’s Angelina Kanana (2.34.48). Kiplagat’s time was also a championship best, eclipsing Lynda Bain’s 1984 effort of 2.41.41. With the Edinburgh marathon falling by the wayside after just one year, due to the withdrawal of one of its major sponsors, the championship returned to Elgin for a third time in 2000 and was incorporated within the Macallan Moray festival of running. The 1999 World 100km Champion, Simon Pride (Keith and District AC), gave the 2000 event a boost by declaring that he preferred going for a first Scottish title rather than defending his world crown in Holland. Pride was born in Swansea but moved to Fochabers in the late 1980s and later worked there as a postman. He represented Wales in 800m and 1500m track races as a youngster and was in the same schools international team as World Champion hurdler Colin Jackson. Simon’s promising running career took a back seat after he left school to join the army at 17. Four years later he moved to Moray, where he settled with wife Linda and took a job as a roofer and sheet metal erector. Running remained a casual, but enjoyable, pastime until a frightening and nearly catastrophic industrial accident changed Pride’s outlook on life. Pride found international success in the world of ultra-distance running. His first 100km, in 1996, produced a Scottish championship bronze medal. The following year he was ninth in the European championships and by 1998 he had a top six finish in the world championship to his credit. Simon benefited from the wisdom of World 100 km record holder Don Ritchie, who lived relatively nearby in Lossiemouth. The Keith and District athlete’s greatest triumph came in May 1999, in France, where he won the World title with a UK road best of 6 hours 24 minutes 05 seconds. It was a superb performance which took the ultra-marathon world by surprise. Even more surprising was Simon’s decision a year later not to defend the World title. ‘I need a break from ultras,’ he said at the time. He decided to concentrate on marathons for a while and, when the opportunity to bid for a Scottish title on his home patch presented itself, Pride was in no mood to miss out. He was determined to win the Scottish championship – and equally keen to break the Moray course record of 2.25.38 set eight years earlier by Fraser Clyne. He achieved both with plenty to spare. Running on his own for almost the whole way, he took advantage of perfect conditions to stop the clock at 2.21.17. It was the quickest winning performance in the championships since 1984, the biggest winning margin ever, and was just 14 seconds outside his personal best set in London four months earlier. Martin Ferguson (City of Edinburgh) was more than two and a half miles behind in second place (2.35.49) and Nick Milovsorov (Metro Aberdeen), who was ‘training for the Amsterdam marathon later in the year’ collected bronze in 2.40.04. Running through the pages of this book have been many varied characters producing a range of gritty performances. No one has ever run a really easy marathon; everyone has had to work hard; many have suffered. What matters is to do the best you can on the day: exploring your potential to the limit. Few experiences can be as satisfying as a really good marathon. The ‘marathon boom’ has gone, although London and other big city events still capture the popular imagination. Nowadays adventure or multi-discipline events are fashionable. But there is a tough simplicity in the classic marathon which should ensure its survival for many years as a great personal and competitive challenge. If road-runners find ways of organising 10k and half-marathon races despite the disapproval of the police; if other event organisers can be inspired by the success of the 1999 Puma Edinburgh / SAF marathon; then marathons will continue to be contested, not only in London, on the continent of Europe and around the world but also in Scotland. This will maintain or even enhance the Scottish Marathon Championship’s fine tradition.